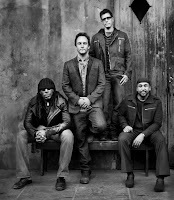 On June 1, the Dave Matthews Band will be doing a show at The Beacon Theatre in New York. The 2 1/2 hour show will air live on Fuse, commercial-free, starting at 9:00 PM ET. Proceeds from the concert will benefit the bands Bama Works Fund which supports charitable programs in the Charlottesville, VA area. The next day, their eighth studio effort, Big Whiskey and the GrooGrux King will be released. To get you ready for the big live broadcast, Fuse will be airing seven days of original Dave Matthews Band programming beginning on May 30. During that time, a four-part original documentary "Dave Matthews Band: The Road to Big Whiskey" will air in support of the new album release. That's a whole lot of DMB. I believe some would call it fan heaven. For more information about "Fuse Presents Dave Matthews Band: Live from the Beacon Theatre," go HERE.